Holidays are ripe with family traditions. Two favorites include making a homemade gift for a sibling on each side of the family, and reenacting the glorious events surrounding the birth of the Savior on Christmas Eve. This year, both came together in a gift for my brother-in-law and his family. I made them a set of Children's Nativity Costumes. Two years ago I made an adult and children's set for my mother. It was expensive and labor and time intensive. The results were gratifying, but I wasn't feeling ready to try the feat again any time soon. This year my brother-in-laws wife mentioned if I might be able to make them some costumes... I guffawed inside...she doesn't sew much...I don't think she really understood what she was asking. My plans were different for their present. But I also love to give people something they really want. I was torn. Then came my brilliant plan. (Hopefully you aren't reading this Christy, it will spoil the surprise!) 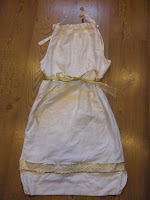 Create my own simplified patterns, using pillowcases. Doing this I was able to create a full set of 6 costumes and a Nativity Pageant script, for under $30 and not an unreasonable time commitment. (Shop for these at a discount store like TJ Maxx or Ross. 1. 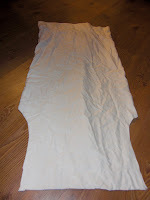 Fold your pillowcase in half lengthwise (hotdog way...spoken like a true school teacher). 2. 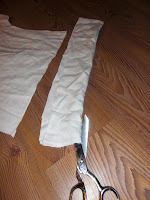 Cut armholes on edge side. The open end of the pillowcase is on the bottom. You are cutting on the top. 3. Unfold pillowcase. 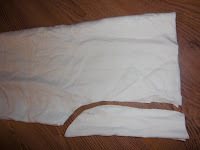 You should now have two identical armholes. 4. 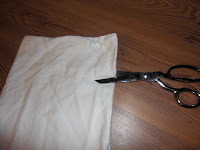 Cut off the top edge of the pillowcase (the closed side). Cut along fold. You will use this piece to make ties. 5. 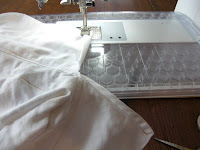 If desired sew trim along the bottom of pillowcase. I just used some wire ribbon from the craft store I got for really cheap. 6. 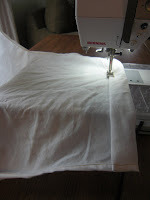 Cut a slit on each side of the pillowcase. This allows for more movement when on. 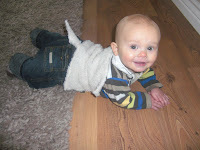 It also allows an adult to actually wear the costume (it is short of course, but the idea is clear). 7. 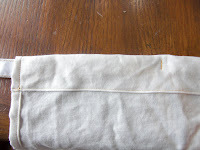 Turn edge over twice and sew a 3/8 inch seam (this will hide any unfinished edges). Your finished slit should look similar to the one below. I make my slits about 6 inches. 8. Fold the tie piece you cut in Step 4, in half lengthwise (hotdog). Sew along one end and the edge. Leave one end open to turn inside out. 9. Use a pencil and turn the tie right side out. 10. Sew open end shut. Iron flat. 11. 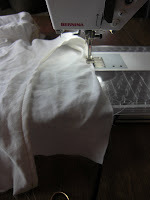 Fold the edge of the armholes over twice. 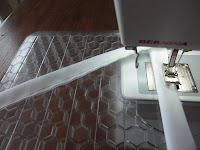 Sew 3/8 inch seam. 12. Fold over the top of the costume twice. This time creating a casing about 1 1/2 inches to thread the ties through. 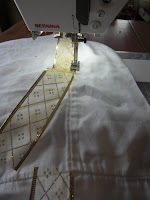 Sew along edge. Repeat on the back. 13. Thread ties through. 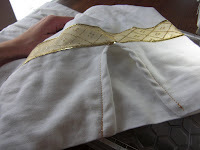 Tack the tie in place in the center by stitching a few times. 14. Tack a ribbon in place on the back of the costume to tie the waste. 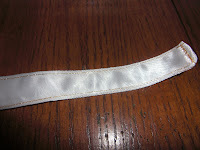 Cut another piece of ribbon for a halo/headband. 15. 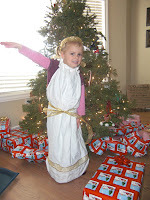 Try your angel costume on a perfect angel. 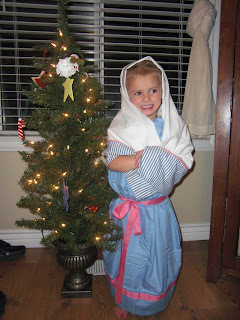 I had to make this darling sheep costume after listening to the talk given by President Henry B. Eyring at the Christmas Fireside given by the leaders of our church earlier this month. His thoughts on how the precious little lambs followed the Shepherds to honor the baby Jesus, the infinite sacrifice...a powerful message for each of us. 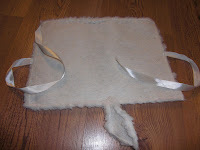 To make this simply cut a small piece of shearling and sew over the edge. 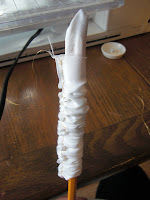 Sew a strand of ribbon on both side and attach a tail. I will wait until after Christmas to post pictures of the other costumes...so I don't totally wreck the surprise for Christy if she reads this!